Estate of Peter Bryan, deceased. Box 8, 1854, Jay County, Indiana, Historical & Genealogical Society. The saga of Peter Bryan and his family continues. Peter was featured in my last Tombstone Tuesday blog and was my 4th great-grandfather. Peter Bryan (1796-1854) and his wife Mary (Huey) Bryan (1799-1864) indicated that they were both born in Pennsylvania when they were enumerated in the 1850 census. (source: 1850 US Census, Monroe, Allen, Ohio; Roll M432_657:369B) The name of Peter’s father is not known and an Internet search shows that there were over 20 Bryan families living in Pennsylvania in 1800. Mary’s father was Jonas Huey, but the name of her mother is not known. The Jonas Huey family lived in Georges Township, Fayette County, Pennsylvania, and Jonas (1769-1848) is buried in Tent Church Cemetery there. You can see a photo of his tombstone on Find A Grave. Peter and Mary were married in Pennsylvania, probably in Fayette County, about 1821-22. Sarah Huey, sister of Mary, stated in Fayette County Orphans Court Records that Mary married before she left Pennsylvania. Peter and Mary moved soon after their marriage and were living in Ohio by 1824. Their son John was born in Coshocton County 15 August 1824. (source: Biographical and Historical Record of Jay and Blackford Counties, Indiana, Lewis, 1887:899) Their other children were also born in Ohio: Byantha (c1829-aft 1900), Joseph (c1831-? ), Hallet (1836-1863), Elisabeth (1837-1905), and Peter L. (1840-1915). In 1830 the Peter Bryan family was living in Madison Township, Licking County, Ohio. They had 4 children by this time: a boy under 5 years, 2 boys 5-10 years, a girl under 5 years, a male and female 30-40 years, and a male 20-30. (source: 1830 US Census, Madison, Licking, Ohio, Roll 134:415) The 1887 Jay and Blackford history indicates that John Bryan was the second child in the family of 8 children. John Bryan’s older brother was probably born about 1822 since couples often had a child about every 18-24 months. In this enumeration Joseph may have been the male under 5, John and his older brother were probably the boys 5-10 years old, Byantha the girl under 5, and Peter and Mary between 30-40 years. It is nearly impossible to know who the male between 20 and 30 years was. He may have been a brother of Peter or Mary or another relative. According to the 1887 Jay and Blackford history the Peter Bryan family moved on to Fairfield County, Ohio, and then to Allen County, Ohio. In 1850 Peter and Mary Bryan were living in Monroe Township, Allen County, Ohio. In this census the family name is written as “Byan”. I wonder if this was the same place they were living in 1840, in Putnam County. Monroe Township is on the border of Putnam and Allen Counties and the county boundary lines may have changed. This will require more research into land deeds and county boundary histories. (source: 1850 US Census, Monroe, Allen, Ohio; Roll M432_657:369B) The Bryan family in 1850: Peter Bryan, age 50, born in Pennsylvania, farmer; Mary, 49, born in Pennsylvania; Joseph, 19, born in Ohio; Hallett, 14, born in Ohio; Elisabeth, 12, born in Ohio; Peter, 10, born in Ohio. The nice thing about the 1850 census is that it gives the names and ages of the other household members. Previous censuses (1790-1840) only show the name of the head of the household. Others living in the household are listed with hash marks under age group categories. In the census years between 1850-1870 we often assume that the others in the household are family members, such as the spouse and the children of the head of the house. However, census enumerations between 1850-1870 do not specifically state these relationships. During those years we often assume that the younger members in the household are probably children of the head of the house, but this would not be considered proof of a relationship for a lineage application. More proof would be needed to prove relationships during those census years. It was not until 1880 that relationships among family members were stated in the census reports. Those few lines told me a lot. 1. 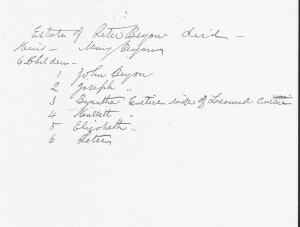 This document named Peter Bryan’s living children. This will be my source to prove that Peter and Mary’s son Hallet, who died in the Civil War, was John’s brother. John is my direct ancestor and Hallet is considered a collateral ancestor. I plan to submit his name for inclusion in the OGS Society of Civil War Families of Ohio lineage society. 2. I assume that only 6 of their 8 children were living when Peter died in 1854. 3. No grandchildren were named as heirs. Their other 2 children probably died before they married. 4. Elizabeth was not yet married in 1854. 5. I learned that Byantha was married to Leonard Curtice [Curtis] and that gave me enough information to research her family. 6. During the Curtis research I discovered that in 1900 Byantha’s niece, Ann Huey, was living with her. Ah-ha! Byantha’s only sister Elizabeth must have married a Huey. Sure enough, I found Elizabeth Bryan’s 1859 marriage record to Andrew J. Huey and was able to trace their family through census enumerations and vital records. 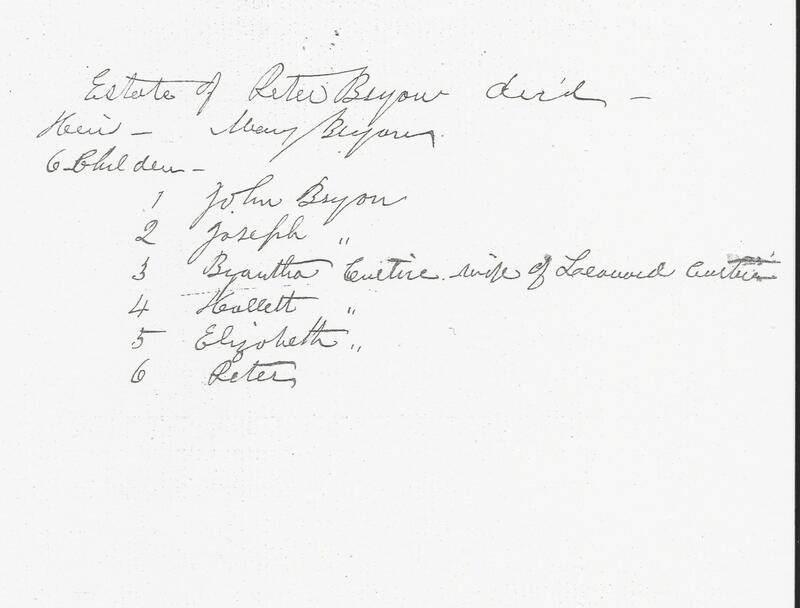 It appears that most of the Bryan family moved to Jay County about 1850. Peter’s son John Bryan married Mary Huey in Jay County in 1848. By 1850 John’s older brother, name unknown, had either moved out of their parents’ home or had died. Peter Sr, Mary, Joseph, Elisabeth and Hallet Bryan also moved to Jay County shortly after 1850. Peter Sr purchased 80 acres of land, the east ½ of the SW ¼ of Sec 27, Town 24, Range 14 for $400 from Chris Huey in September 1850. Peter Sr died in 1854 and is buried at Pingry Cemetery. Byantha married Leonard Curtis in Putnam County, Ohio, in 1847 and they remained in Ohio. Daughter Byantha Curtis was living in Paulding County, Ohio, with her family in 1860: Leonard, 30, born Oh; “Brantha”, 21, born Oh; Martha, 8, born Oh. (source: 1860 US Census, Monterey, Putnam, Ohio, Roll M653_1027:473) It appears Byantha’s age was about 10 years off in this enumeration. Ages can and do vary in the census enumerations. Keep watching here for more Bryan and Huey information. 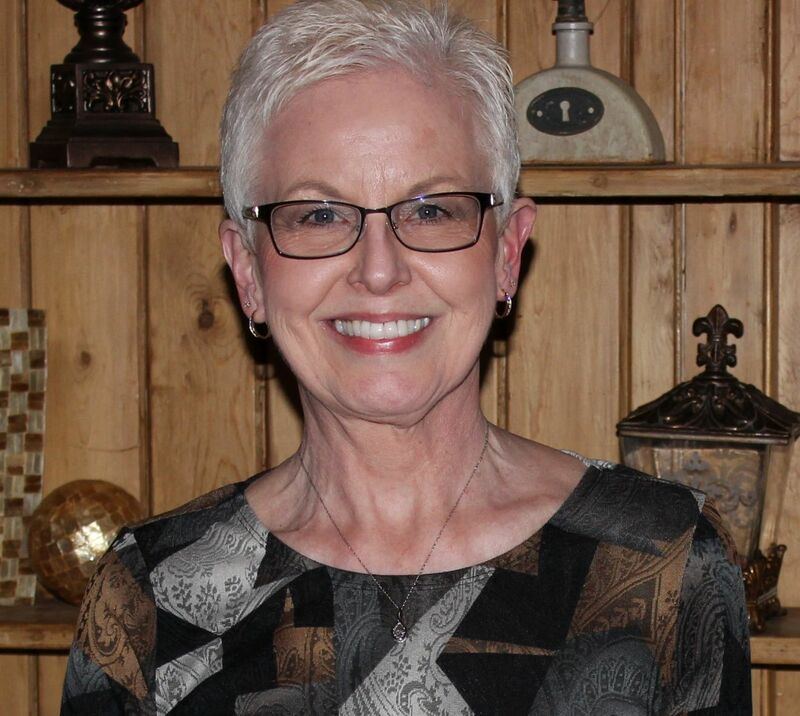 Hi again, I know I contacted you a long time ago about a Jane Bryan and you did not see any connection to your family of Bryan’s. Well I just got my birth certificate from Illinois and found that Jane Bryan was 21 yoa when I was born, which was 4/15/1954. But she is shown to have been born in INDIANA. I have found then names of whom I THINK may be her parents and I was wondering if any of this info now looks like it might be connected to yours. I am looking and Agnes S. Bryan DOB approx 1901 in Indiana and Charles L. Bryan approx DOB 1904 in Indiana as her parents. Jane with a DOB of 8/21/1933 (possibly), in Indiana and her brother Phillip Bryan Approx DOB 1935 in Indiana. It looks like Gaston, Indiana- Delaware County. That is all I have for now but am still Looking for Jane!!! Any help would REALLY be appreciated. I am kind of stuck…but I have more info than I had before…I have a real state where Jane was born!!!!!!!!! THANK YOU again for anything you might have!!! !